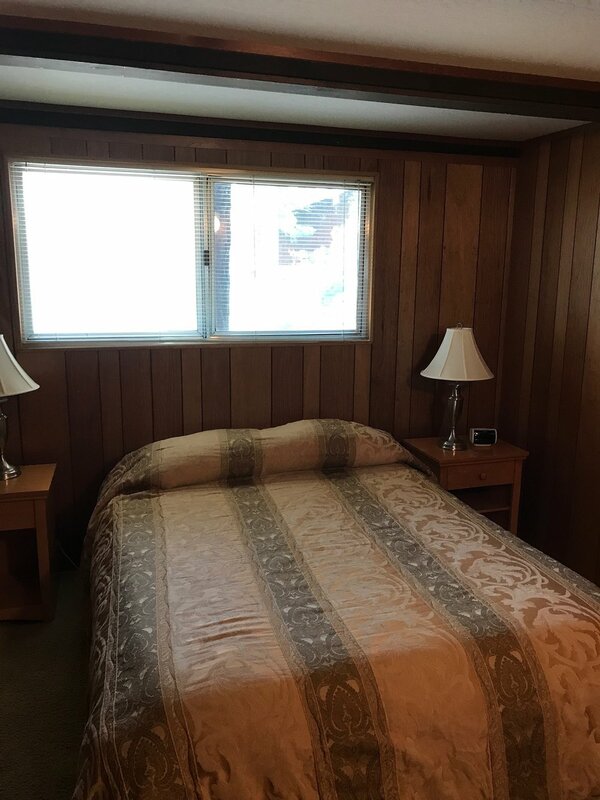 This summer we bought a 1970's Gambrel in Lake Tahoe. 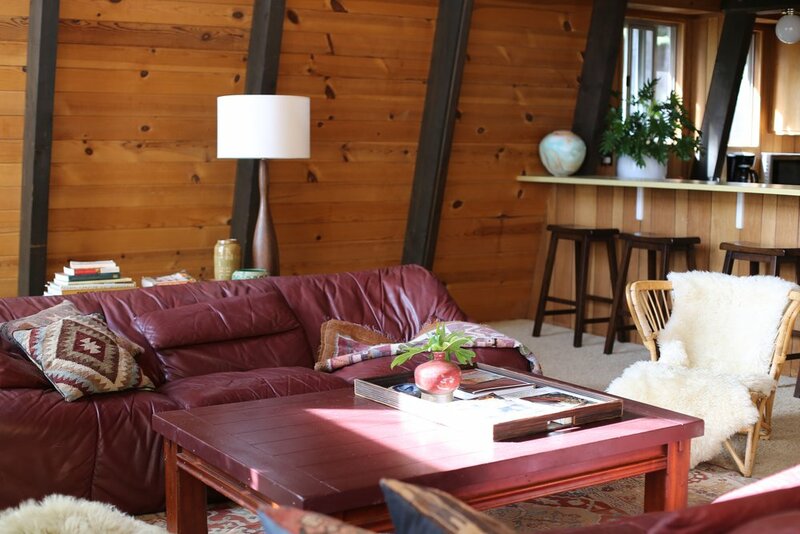 Gambrels are modified A-Frame houses with flatter rooftops that allow for more useable interior space. 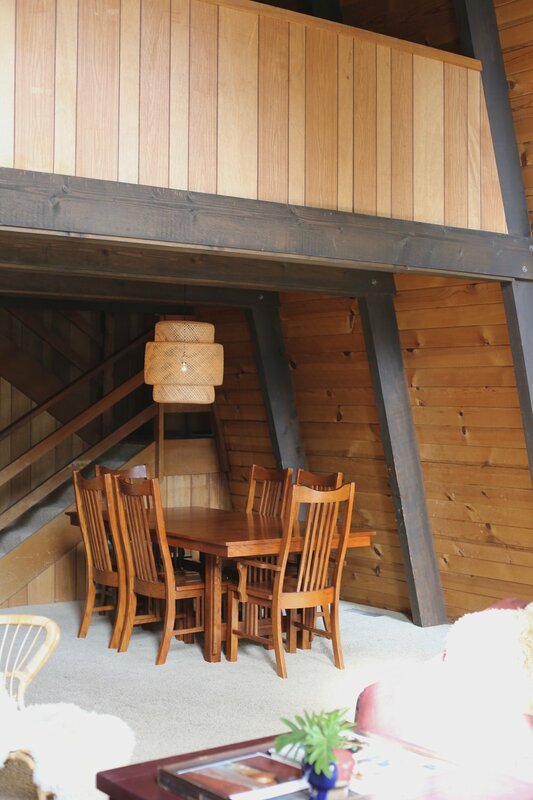 The house is not without its period quirks: manmade paneling, formica counters and wall to wall carpeting. Having said that, the layout of the floor plan is very efficient; it provides plenty of space for both private and communal areas. In time we will renovate key areas such as the kitchen and bathrooms, but we're determined to preserve the home's cabin like feel. In the interim, it has been decorated on a budget. I shopped flea markets, consignment shops and even our 'primary residence' to create spaces that are cozy and comfortable Cocoon Home style. So far, it's been great fun. We've enjoyed time alone and also with friends and family. The home is located very close to Tahoe City in a community that offers an Olympic size pool, tennis courts and access to a private beach. Our children hop on their bikes and they're off to enjoy lots of different activities. We're looking forward to sharing it and, eventually, to have it listed on Airbnb. If you're interested in renting it before then, DM me. 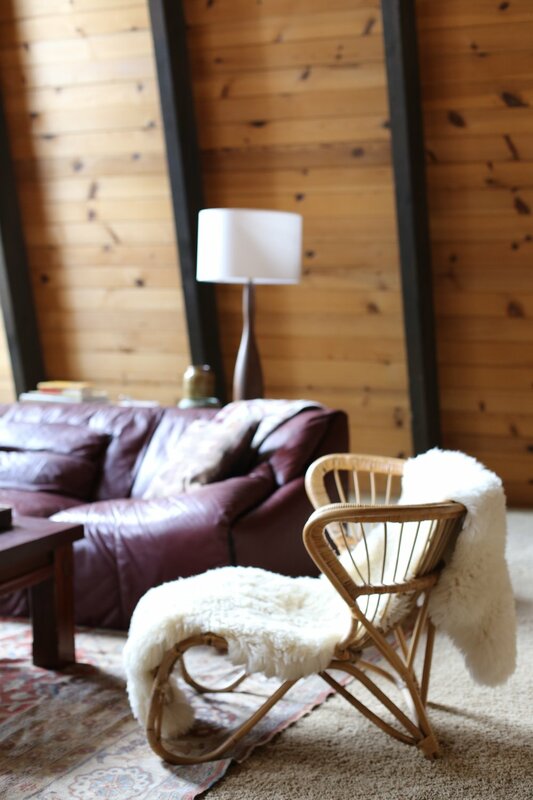 A pair of vintage Ligne Roset leather sofas from the 80's framing the stone fireplace create the perfect place to chill. The wicker Fox Chair is a find from the Alameda Flea Market, the coffee table (that came with the house) was repainted to match the sofas, and the large area rug was scored at a Berkeley consignment shop. Replacing the original dining area light fixture with the one from Ikea, gave that space a more current look and feel. Although, I must admit that I can't wait to eventually replace the table and chairs. The fireplace was stripped of its tacky ivy vines (why are people still doing that?! ), the golf course image and the nondescript figurines and left in a 'minimalist' mode. The plan is to collect ceramic pottery to line the mantel. African textiles and colorful area rugs (from different flea markets) and brand new bedding from Target gave the bedrooms a fresh and inviting feel. 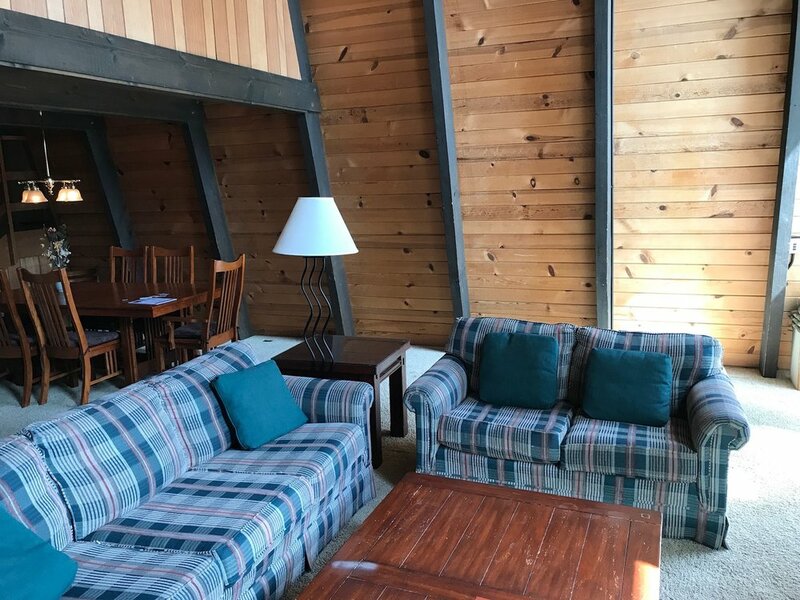 I found this wicker sofa on Craigslist on July 4th and cajoled my MIL (who also loves a good find) to drive down with me to San Jose in her minivan to pick it up that same day! I have no idea how we got to fit this beautiful piece of craftsmanship into her van, but we did. At some point it will be reupholstered but for now I'm digging the floral motif. The Natuzzi leather chair was originally in our twin boys' nursery back East, and has since moved with us a couple of times. I'm so glad we kept it, because it fits perfectly in the upstairs loft area. We replaced the white plastic outdoor furniture with slicker pieces from Target which blended seamlessly into the deck space, which BTW, has filtered views of the lake and the snowcapped sierras. With each of her moves, my mother-in-law recreates homes that speak to her love for plants, books, art and colorful textiles. Her latest landed her in a space she professes to love even more that her previous ones. I'm always amazed by how well she combines her favorite [old] possessions with newly acquired pieces and accessories. In her newest residence, she showcases more of her work, PodArt, the organic feel of which blends seamlessly into her decorating style. PodArt reinforces her love for nature inspired art that successfully adds character and texture to any interior. 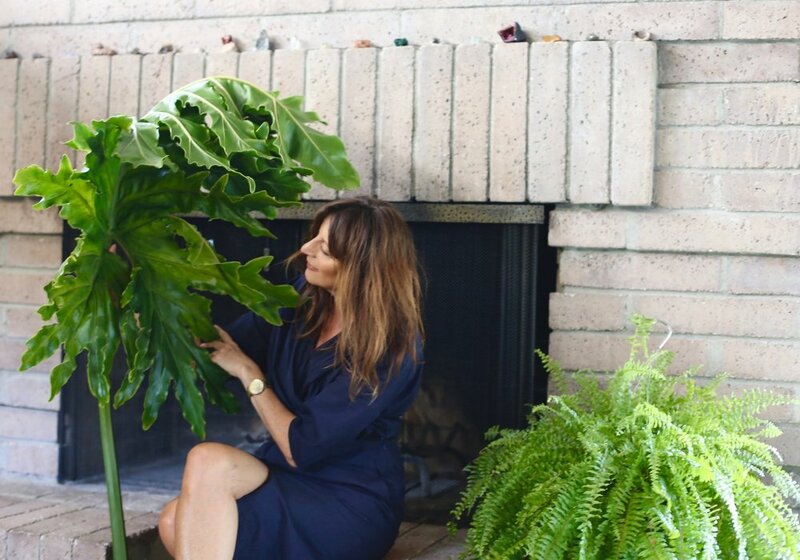 Whether is by creating vertical gardens or assembling interesting vessels brimming with native botanicals, she devotes as much attention to her outdoor spaces as she does to her indoor ones. No matter where she lands, her love and devotion to her "Munchkins" (as she likes to refer to our children) is loud and clear, as is one her favorite mantras: "I've never met a wall I didn't like". Her dining room combines her treasured Russian fairy tale plates and her favorite chandelier with slick [really comfortable] seating on a colorful dhurrie rug. When not creating PodArt or tending to her many plants, Natalia spends quite a bit of time in the kitchen creating new dishes or mastering old ones for the enjoyment of our family and friends. 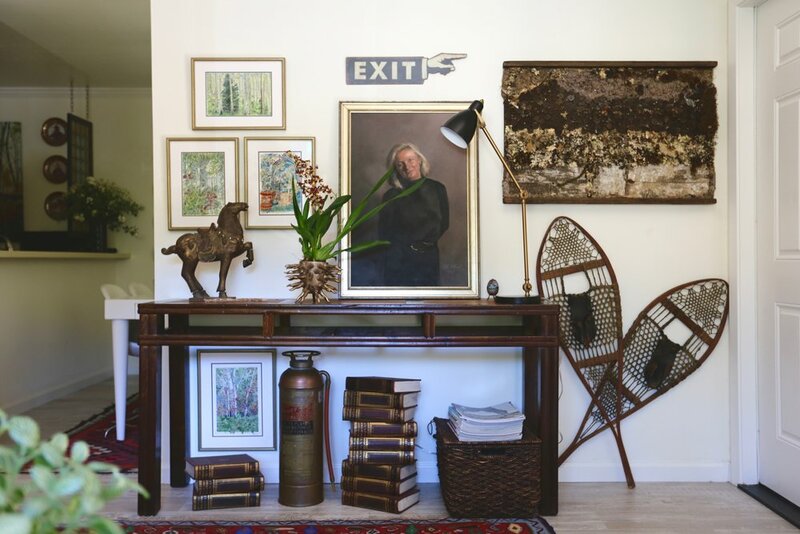 Her entry way reflects her sense of whimsy and aesthetic sense of balance. 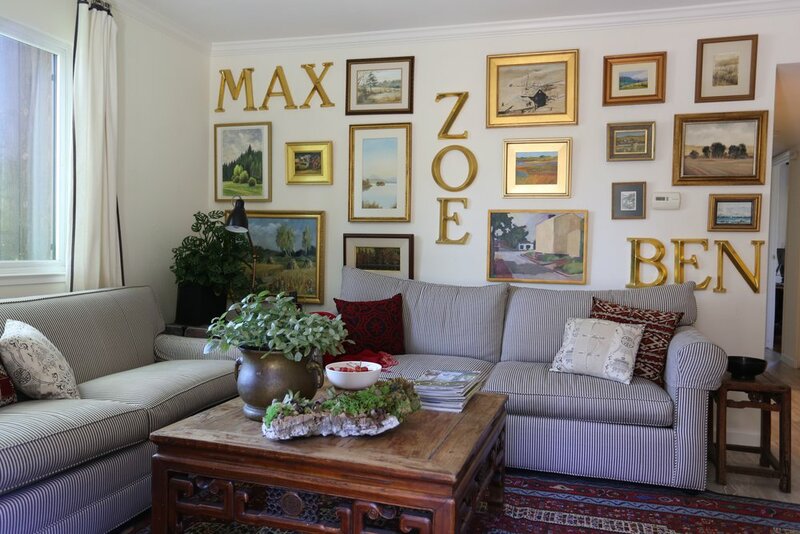 The beautiful ink and watercolor work on the wall is by her mother, Nadia, who is the original artist in the family. She is still drawing and painting at the 'young' age of 87. The featured PodArt is one of Natalia's first works and one she couldn't part with. Her study is home to most her books, to art painted by my husband as a 5 year old boy, and glass terrariums created by the Munchkins, suspended from a foraged Manzanita branch. 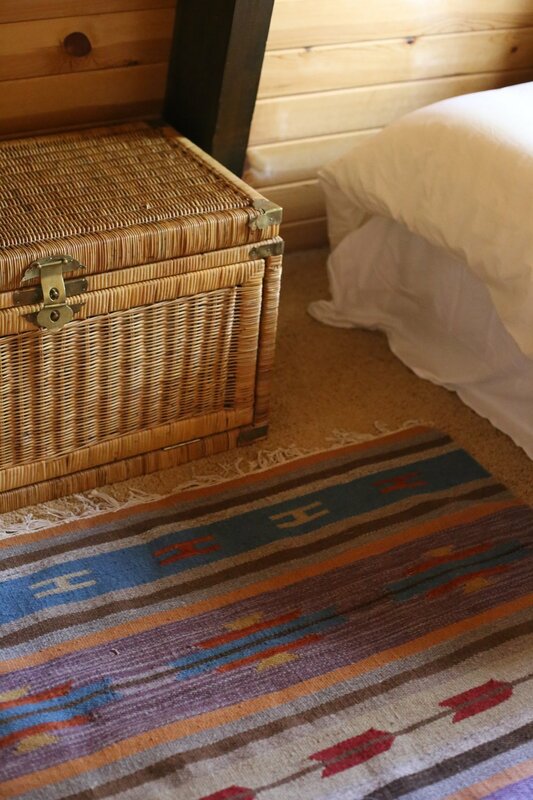 Incense burns in a Sansevieria pot, next to stacked vintage suitcases that double up as a night table. The bedroom's warm hues reflect Natalia's ever present drive to create spaces that are cozy, yet uniquely relevant. Please check out her website www.podartca.com and stay tuned to learn about her future shows and exhibits.